Fashionable Tory Burch Fitbit Collection is Now Released! Fitbit is considered as the pioneer of fitness tracking producing gadgets in the shape of a wristband. Released earlier last year, Fitbit provides water-resistant Fitbit Flex wristband which tracks everything ‘health’ about you. While we are seeing more mass-centric wearable technology in the shape of Samsung Gear Live, LG G Watch, and expected Moto 360 and iWatch, Fitbit has remained the favorite of health conscious consumer market. In an attempt to make the wearable more fashionable – which is apparently swaying every tech company around – Tory Burch has officially launched her high-end accessory collection for the Fitbit Flex. Announced on Tuesday, Tory Burch Fitbit collection brings a refreshed style to the usual unattractive concept of a fitness tracker. No more cheap rubbers or plastics, Tory Burch Fitbit comes more like a jewelry accessory than a fitness tracker. Tory Burch has worked with the company to release four accessories that “house” the Fitbit’s core, which can be popped out of the band when not needed. Thus, Tory Burch Fitbit can be used without the tracker and as a standalone jewelry item too. FitBit health tracker tracks your movement around the clock, and during sleep too. It counts every step you take and every calorie you burn. Syncing beautifully to any gadget around you – computer, iOS and Android smartphones – FitBit makes your health life a little bit easier. Making goals and following them is just a tad bit easier with FitBit. Considering that now you don’t need to look any less-fashionable, Tory Burch brand would just give the tracker that needed appreciation. In the past few months, we have seen tech titans like Google and most recently Apple hiring some high fashion names from Burberry and Swiss watches. The wearable technology is increasing trying to be both more ergonomic and fashionable on your wrist. You can get any of the four available Tory Burch Fitbit designs from ToryBurch.com or Fitbit.com along with a select Tory Burch boutiques. The two silicone printed bracelets come at $38 in signature Tory Burch colors of blue and pick. 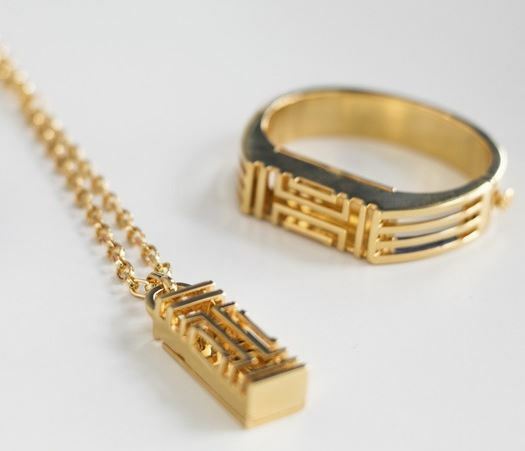 The most fashionable, and completely different looking, designs are though pendant necklace and the hinged bracelet coming at $175 and $195 respectively. Produced with brass, while the material is not that of the highest quality, oozes the signature elegance of Tory Burch accessories transforming the gadget into a high-end jewelry item.